ParentingABC-Blog: How Well Do You Handle Anxiety? Anxiety is different than fear but it is related to it. Fear is a feeling of tension that is associated with a known source of danger. Anxiety is also a feeling of tension, but in this case, the danger or the threat of danger is unknown. Anxiety is often anticipatory—worrying about the future. Without apparent reason, a person may worry about the success of their business or fret over the health and well-being of a child or feel apprehensive about their own health. Anxiety is the culprit that wakes us in the night and won't let us go back to sleep. It distracts us and makes us irritable and forgetful. Physical symptoms can include trembling or shakiness, clammy hands, dry mouth, sweating, headaches, neck pain, frequent urination and heart palpitations. 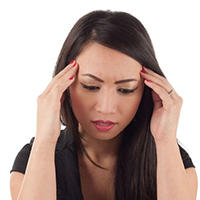 Mild anxiety is normal in our daily lives and can be eased with some basic tools. Answer the following questions to find out how well you use some of these tools. 1. When I feel anxious, I take deep breaths to ground myself and calm myself down. 2. To ease some of the tension, I relax my body and physically release the tightness in my shoulders, neck, arms and chest. 3. I vent my feelings of anxiety by writing or talking to someone. This helps get the strong emotions off my chest and out of my body. 4. I channel the tension into some kind of physical activity like walking or sweeping the floor or doing the dishes, watering the yard. 5. I get a reality check by talking to someone I trust about my reasoning or thinking or the conclusions I've come to. 6. If I know I'm going to be in an anxiety-producing situation, I plan through how I will handle it; I get myself ready. 7. I watch how others get through stressful situations and model them; I ask questions about the best way to handle situations or events or people. 8. When the same anxiety comes up over and over, I log and assess possible causes and solutions. 9. When it doesn't interfere with my normal life, I generally try to avoid people, places and events that I know will produce anxiety. 10. Sometimes, when I have to face a situation that I know will cause anxiety, I take someone with me. 11. I face and take responsibility for problems and commit to a plan of action, rather than avoiding, denying, minimizing or blaming. 12. I nurture a positive attitude. 13. I seek support from friends & family, counselors, support groups, church, etc. 14. Before doing anything else, when I feel anxious, I go directly to my Savior and Lord Jesus Christ to ask for help. Why? Because I believe. Anxiety is a normal emotion that most people experience during the course of their daily lives. Some of it is healthy and can motivate us to get the hard things done. However, more intense feelings of anxiety are emotionally painful and can interfere with a person's daily functioning. If you're concerned about your feelings of fear and anxiety, don't hesitate to call.